Research by engineers at the University of Southampton into reducing railway noise has created an exciting new technology that is being used to expand rail networks in Europe and Australia while preserving the quality of life for people who live nearby. Under a licence agreement with the University, Tata Steel has supplied patented rail dampers that have been fitted on track in 16 countries. These dampers have proved particularly crucial for a new rail line in Sydney. 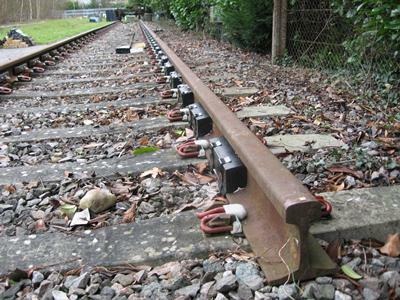 Historically, engineers have sought to cut rail noise by installing high barriers or sinking track in cuttings. However, costs are prohibitive and barriers can blight the landscape and obscure the view and the quality of life for people in nearby homes. Since 1996, a team of researchers at Southampton’s Institute of Sound and Vibration Research (ISVR), led by Professor David Thompson have been working on new and economically viable solutions to cut noise from vibration. The ISVR has been a key partner in a number of European Union funded projects. In Silent Freight and Silent Track, the ISVR developed theoretical models to predict more accurately levels of noise caused by the rolling of steel wheels on steel rails. These have been incorporated into the software program TWINS (Track Wheel Interaction Noise Software). It analyses the effect of wheel and track design changes on the noise produced and allows design modifications to be assessed that can control noise at its source. Rail is more environmentally-friendly than most forms of transport. However, new rail projects around the world are under threat because of increasing noise pollution and public opposition to more development. Although policymakers seek to expand sustainable public transport networks and increase passenger capacity, there are frequent campaigns against new rail lines, such as the objections to the proposed high-speed line HS2 in the UK. 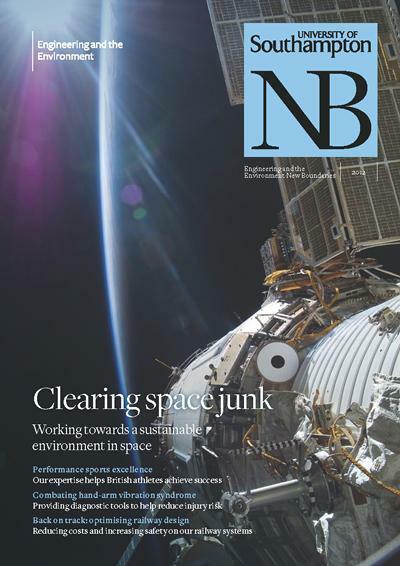 Achieving a sustainable increase rail traffic and facilitating a modal shift from other, more damaging forms of transport, can only be achieved through the implementation of better and more cost-effective measures to reduce noise. ISVR research has explored railway noise as a whole and shown that both the wheels and the track are responsible. Although several solutions exist to reduce wheel noise, there was no practical way to cut noise from the track. Southampton engineers, in collaboration with British Steel, now Tata Steel, developed an innovative rail damper, made of steel embedded in rubber. It is directly attached to the rail and reduces the noise by attenuating the vibrations transmitted along the rail. Several prototypes were tested in the ISVR laboratory and a lengthy process of experimental work determined the best composition of the damper. Field tests in 1999 demonstrated a substantial noise reduction of 6 dB, although the actual reduction achieved depends strongly on the track it is fitted to. This damper development is part of a wider body of work on railway noise and vibration at the ISVR, worth £2M in total funding to the University since 1996 from the Engineering and Physical Sciences Research Council, European Union and industry. It culminated in a definitive book on Railway Noise and Vibration by David Thompson in 2008. The ISVR/Tata Steel rail damper has made possible the expansion of rail services in Europe and Australia. Rail dampers are the only technology, apart from expensive and intrusive noise barriers, capable of delivering noise reductions at source of up to 5-7 dB. The benefit-cost ratio of rail dampers is twice that of barriers. Rail dampers manufactured and sold by Tata Steel have been installed in 13 countries since 2001. In Australia, the ISVR/Tata Steel rail dampers were used in 2009 to resolve severe noise issues on the controversial Epping to Chatswood Rail Line in the northern suburbs of Sydney. Network Rail’s £6bn Thameslink programme, which is upgrading the north-south route through central London, made the first installation of rail dampers in the UK at Blackfriars Station in 2012. Network Rail is now considering the use of rail dampers on a national scale as part of work to comply with the EU’s Environmental Noise regulations. More generally, this ISVR research has led to improved quality of life for people living near railway lines and ultimately opened up the potential for a sustainable shift to rail away from more carbon-intensive means of transport such as road. Thompson, D. J., & Jones, C. J. C. (2000). Using theoretical models to design low-noise wheels and track. In Sustainability and Environmental Concerns in Transportation. (pp. 51-56). (Transportation Research Board: Journal of the Transportation Research Board; No. 1702). London: Transportation Research Board. Thompson, D. (2008). Railway noise and vibration: mechanisms, modelling and means of control. Oxford, UK: Elsevier Science.